Hi, Susan here from Organized 31. We’ve just completed a kitchen renovation in our house so I have organizing the kitchen on the brain. I thought I’d share some tips I used in planning and organizing pots and pans in our new kitchen. Every house is different and every family’s needs are different, but these are tips that have worked for us and may help you discover what will work for you. With over 20 military moves under my belt, I’ve seen quite a few kitchens in my time. I learned (over and over and over again) what did not work for my family. I was so fortunate to be able to plan our new kitchen to incorporate many features that work beautifully for our family and make my busy life more organized and thus easier. 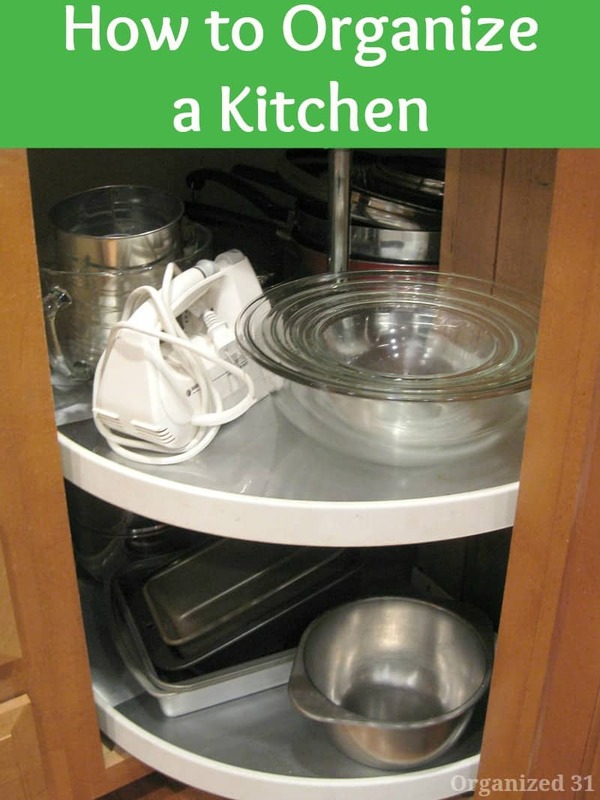 I prefer pull-out drawers for pots and pans rather than a cabinet. Drawers allow you to easily reach all the pots and pans, even the ones in the back of the drawer. No more laying on the floor and practically climbing into the cabinet to reach the item you need that’s far in the back. If you have an existing cabinet and there’s no kitchen renovation in the near future, you can purchase drawer kits that will fit into an existing cabinet and allow you to have the convenience of storing your pots and pans in a drawer. Organize your pots and pans so that the ones you use most often are most easily accessible. Make your life easier by putting the items you use most daily in front or on top so you can easily grab them when you need them. It will save you time, but more importantly it will save you the hassle or wrestling with all those things you don’t need, just to get to the one you want. I use my pans more often than my pots so I placed them in the upper drawer where they’re easier to reach day in and day out. Place seldom used items in the back of the drawer or cabinet. This is similar to Tip 2, but it bears repeating. If you’re not using the item daily or weekly, then put it in the back of the drawer or cabinet. I placed the double boiler and steamer in the back of the drawer because I use them less often. Use a basket to organize the pot and pan lids. I used to stack the lids in my pot drawer, but they would just slid around when I opened and closed the drawer. I picked up 2 inexpensive plastic bins that now hold the lids neatly in place. I prefer plastic bins because they can easily be wiped out and cleaned up. What tips do you have for organizing your pots and pans? Stop by Organized 31 today to see the final result of my kitchen renovation. It’s been 3 weeks with my new kitchen and I still smile every single time I walk into the kitchen. All those years of old, dysfunctional and plain ol’ crazy kitchens have paid off. I like to put my things where they are used, as in glasses above the sink/next to the fridge, plates above where I dish up & also where the toaster oven is, baking pans next to the oven & the counter where I mix, etc. I have all my cooking utensils in the island where my cooktop is. its always interesting to see how others do it! Plastic bins for the lids……genius!!!! Seriously, I am very organized and have ALWAYS and STILL struggle with pots, pans & lids. I have lots of cabinet space but no drawers free for pots and pans. My lids are in one of those horrible “lid organizers” that make all of them fall and get tangled up every time you try to find the lid you need. Tomorrow, I am trying the bins.